In a precedent post we showed the time evolution of the media impact of the most affected cities in Japan by the earthquake, the tsunami and then the nuclear crisis, among cities with more than 100,000 inhabitants. Our results showed that media attention to Fukushima nuclear crisis suspassed the media coverage about disaster in Sendai by Marh 12h, two days after the quake. Now we show some elements concerning the media coverage given to Japanese prefectures affected by the earthquake and the tusnami. We will put our results about media impact in relation with actual damages. We use as source the official figures provided by the National Police Agency of Japan. This agency provides daily updates the damage situation concerning the number of killed and missing people by Prefecture, and other data about property damages. We are conscious that we are dealing in this post with tragedy and suffering when we use death toll as reference measure. We try to be very respectful, but we understand that showing this kind of empirical analysis can be useful for other researchers and scientists. The list of prefectures included in our analysis pertain to the following regions: Hokkaido, Tohoku and Kanto. 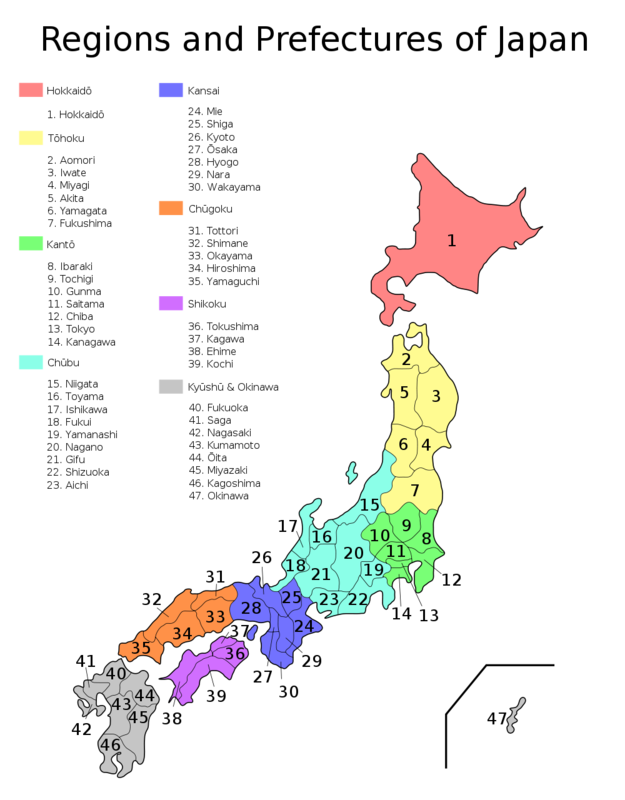 They refer to Prefectures 1 to 14 in the map (map by TheOtherJesse [Public domain], via Wikimedia Commons; originally from Montydrei, English Wikipedia, with no copyright claims). 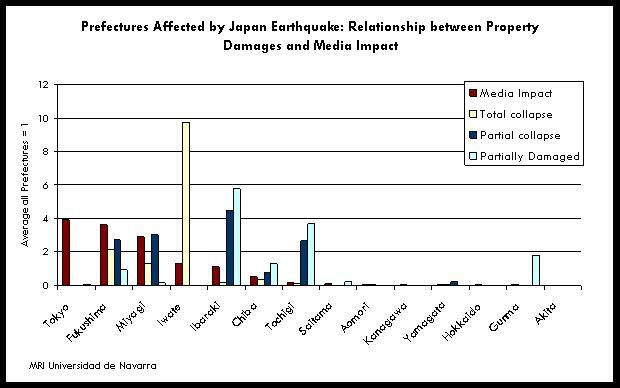 The following graph show the media impact reached by each Prefecture during the first week after the quake, in media in English in relation with the Japan eathquake. The prefecture most present in the news as a such (in relation with the Prefecture) is Tokyo, with a media impact value of 3.89 (value 1 corresponds to the level of news received by the avearge of all 14 prefectures scrutinized). 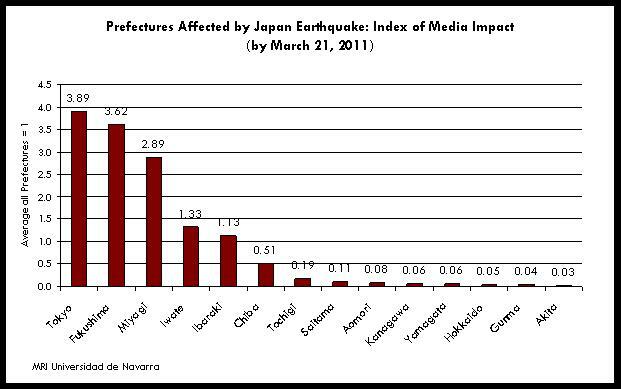 Second in importance by media coverage is Fukushima, with 3.63 points. Miyagi follows in third place, with 2.89 points. Other Prefectures with substantive levels of media attentiona are Iwate (1.33), Ibaraki (1.13) and Chiba (0.51). Now we show these results in parallel with the number of human casualties and property damages in each prefecture. As explained before, we use as reference the official number of casualties and damages provided by the National Police Agency of Japan (Emergency Disaster Countermeasues Headquarters). Our results indicate that the main Prefectures by media coverage have suffered practically all personnel casualties. They are concentrated in Fukushima, Miyagi and Iwate. 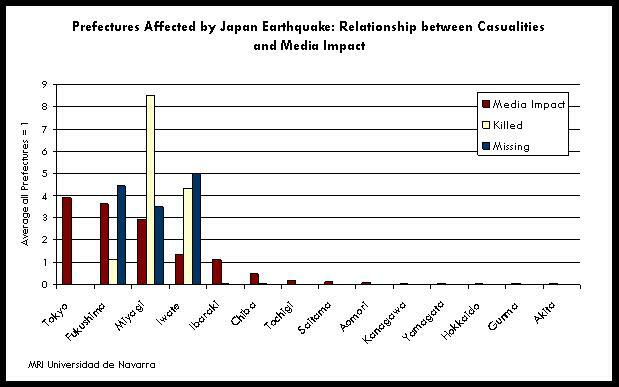 Tokyo is the main reference in terms of media coverage, but has suffered the earthquake consequences only marginally by comparison (7 people killed). Tokyo is media reference because of capitality and being the most populous city affected by the disaster. Ibaraki receives also more media attention than the number of casualties suffered; this will be explained when referring to propoerty damages. In the opposite side, Iwate Prefecture is less present in the media than the actual personal damages suffered. Next figure compares media coverage to the extent of property damages. In some Prefectures this measure is in line with the death toll and missing people, but Toguichi and Ibaraki supported relevant material damages with a reduced number of human victims. Iwate Prefecture concentrates the highest number of properties classified as totally collapsed (74.7% of all cases). Again, we find that this Prefecture has suffered a devastation which has not received the same amount of media coverage than other Prefectures. Media coverage received by Ibaraki, Chiba and Toguichi is explained by physical devastation, while we showed in the precedent figure that they were basically spared from human casualties. We have analyzed the global relationship between media coverage received by the 14 Prefectures during the first week and the extent of the human casualties and damages to property. We have excluded from the analysis the case of Tokyo, as it behaves as an outlier. We have estimated simple correlations. 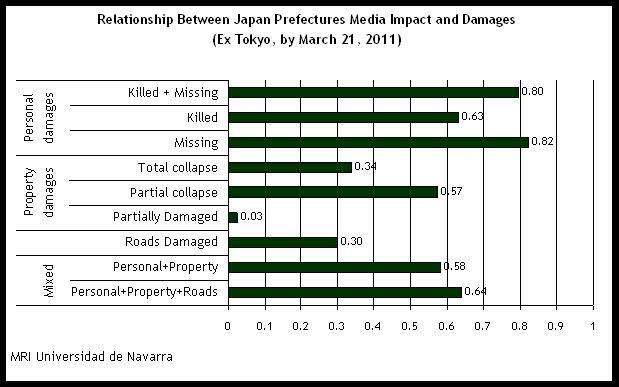 Death toll appears to be the main driver of media coverage to Japan disaster. The combined number of killed and missed persons reaches a correlation coefficient of 0.80. Looking at the relationship between media coverage and property damages, we find that the relation is stronger concerning collapsed homes, totally or partially, than for partially damages houses. This is probably reflecting the fact that media attention turned to devastation caused by the tsunami, rather than the direct impact of the earthquake. If we use mixed measures of personnel and property damages, the relationship with media coverage is not improved.